【Slow Down Feeding Ball】Once putting treats in ball,Your dogs and cats have no choice but to eat what is dispensed. 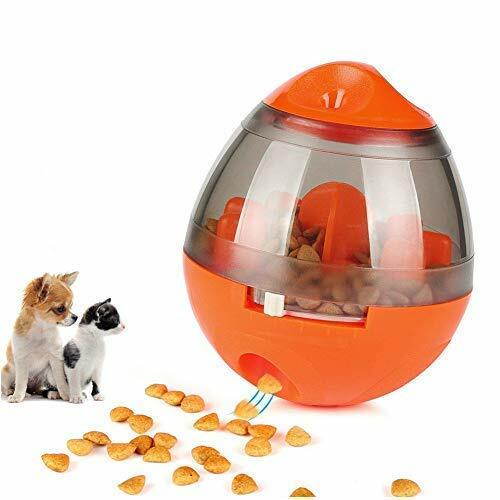 They need do more work and physical exercise to get the food.So the interactive food dispensing ball toy will slow down feeding. 【Pet IQ Treat Ball Toys】Specially designed within the tumbler feeder enables dog or cat to overcome some obstacle to get the food.This hard work is rewarded with food or treats coming from the toy,which serves as a toy and a food dispenser .So increase IQ of your pets. 【Keep Pet Healthy & Activity】The transparent storage and the top of the 3 air holes allow your pets to see and smell their favorite food inside and get them interested to interactive with it. So that to reduce boredom and destructive behavior through healthy play and exercise, while developing and maintaining their mentally and physical alertness.Feeding and Training,healthy and activity . 【100% Safe Material & Easy to Clean】The dog ball dispenser is made of ABS+PC material, 100% safe for our pets and stable, durable, non-toxic and safe food container.The food dispenser Toy has two parts which can easy to open, it's easy to put more snacks , easy to clean. 【12 Months Warranty】We strive to provide you with the highest quality product and the best customer experience, if you have any question, please just feel free to contact us at any time.12 months warranty is available and all the emails will be replied within 24 hours.